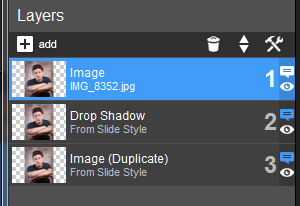 In ProShow 7, when you drag a picture, or any other file into your slide, you can see the name of the file, but not its extension. Instead, you get to see the type of the layer. ProShow automatically gets your layers categorized as either image, video, gradient, or solid. If you like to use masks, and all sorts of other decorations, as I do, you'll never know if you are using a jpg, a png, or maybe a gif file. To get this information you have to hover over the layer and then read the tool-tip that is being displayed, together with all the path of that file. 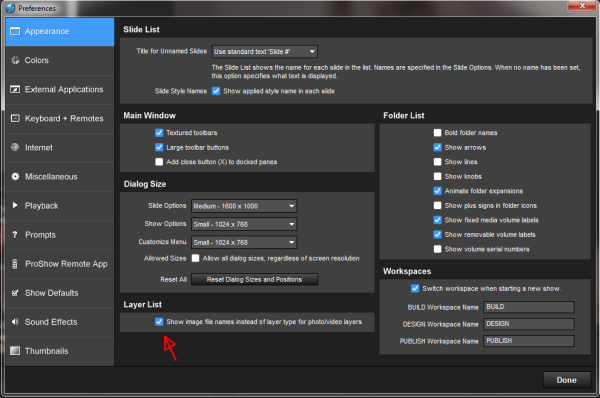 Of course, you can also see the full name of the file if you click in the Layer Settings tab, and look at the right of the screen, but why would you want to do that when you are working on Effects? This gets even more problematic once you apply a slide style. Then, all you get to see from the picture that you just inserted, is the laconic name: Image. What image is that? Again, you can't know unless you hover over that layer. If you are as unhappy with this as I am, and you prefer the way things worked in previous versions of ProShow, then you must make a small change in the program Preferences. You will find that a new Preference has been added to the program, in order to address just this need. 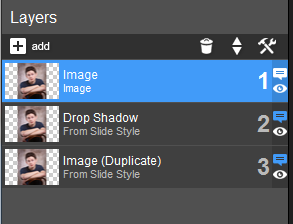 Put a check-mark on "Show image file names instead of layer type for photo/video layers"
Once you do that, the full name of file is displayed, together with its extension. I have bought V7 but still use V6. I will change my preferences as soon as I install V7. If you bought already ver. 7, what are you waiting for? There is very little difference between ver. 6 and 7, apart from the new Music Library and the new icons. Are you afraid that you won't like the new look? You'll get used to it in no time at all. You know the saying "Plus ça change, plus c'est la même chose". I changed to V6 a few month ago only. I usually avoid to install the new version before the 3rd correction (for most software) ! Mona, you've solved my greatest source of displeasure with version 7! I'm heading for the Preferences section right now.